The swim is the hardest part of the day for Gyde, and he exited the water in 1:08. However, many athletes were slower in the swim this year, and his time was the same as last year, so that can be seen as a small victory. What is most important is to understand that while he may have been able to swim faster, the energy expended early might have cost him on the bike or run. A 2.4 mile swim taxes athletes more than most realize, and being able to come out of the water feeling ready for the bike and run is better than swimming faster but feeling tired. Even with this hard situation, Gyde put up some strong numbers. He averaged 262 watts for the full 112 miles, which at a weight of 75kg (165lb) is 3.49 watts/kg. This is a solid number for an age group male athlete. However, his power did drop off significantly from the first 56 miles to the last 56 miles. On the way out, Gyde put out 278 watts but only 245 watts for the way back. This is more likely to the cramping he was experiencing and not due to poor pacing. Looking back at 2013, Gyde put out 284 watts on the way out and only lost 8 watts over the back half. Additionally, his comments speak to the difficulties he was facing, “The second half was really survival with some relief during the section around Kawaihae where we had a strong tailwind,” he said. One aspect that Gyde nailed, and any athlete can do no matter how fit they are or what they are experiencing, is to put power out in an even manner. Big efforts, like hammering up rollers or going out too hard at the start, burn energy much faster than if you put your power down evenly. They may not hit you immediately, but too many big efforts will eventually catch up with you. The Variability Index ® (VI®), measures just that, the variability of your power. Over an Ironman, a rider’s VI should be 1.05 or less, and we see that in both years Gyde was under this, at 1.03 this year and 1.04 last year. By metering his effort out smoothly he ensures his energy cost is kept even, and he won’t have any surprise bonks down the road. The other component of a solid bike is riding at the correct intensity. Using Intensity Factor® (IF®), which gauges your effort against your Functional Threshold Power (FTP), or what you can sustain for one hour. Top pros are typically at .80, while strong age group athletes would be around .75. This year, Gyde rode at .85 IF. Since he didn’t blow up at any point, which is the typical consequence of riding at too high an IF, Gyde’s FTP (set at 320) is likely a bit low. He is probably closer to 335 watts. View Gyde’s Rotor power file. 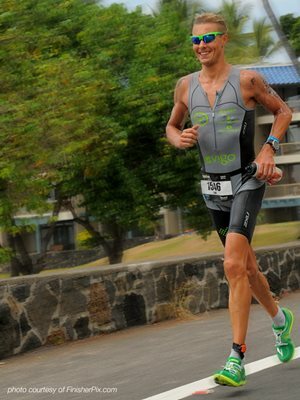 In 2012, Gyde also had a string of injuries but was still able to run under 3:05 in Kona, so he set out with that same goal. The first 10 miles along Ali’i Dr. are relatively flat. On this section, Gyde averaged a 6:58/mile pace. However, looking at his Normalized Graded Pace (NGP), which shows what the pace would have been had the road been flat, his pace drops to 6:52/mile pace. Using NGP gives a better accounting for the energy expended. This pace put Gyde at an average heart rate of 144 bpm. This effort is at the high end of his aerobic capacity, or zone 2 HR. 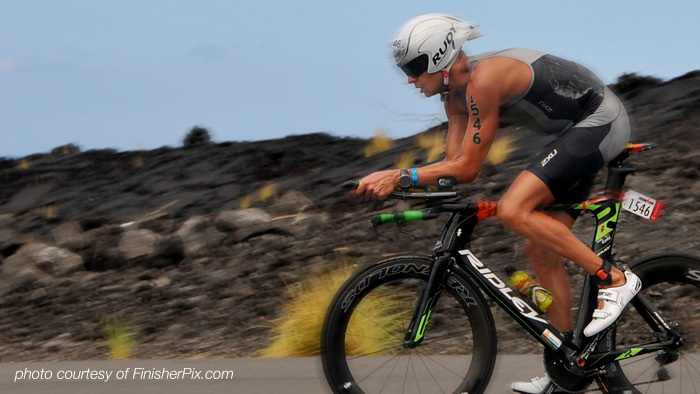 This highlights the fact that Ironman racing is all about your fast you can be while staying aerobic. Gyde, like all athletes, slowed when he headed up Palani Rd. His pace was 8:32/mile, but his NGP was 7:05/mile. What this says is that while his pace was 8:32/mile, had he put out the same effort on a flat road he would have been running a 7:05/mile pace. This illustrates in greater detail how NGP gives a clearer indication of the overall effort, rather than looking only at pace per mile. NGP also makes it easier to compare your effort over the entire course since it takes elevation changes out of the equation. Once out on the Queen K, Gyde settled in and never really faltered. His pace stayed steady with his NGP staying around a 7:00/mile. His slowest point was coming out of the Natural Energy Lab, where he went down to a 9:38/mile. His final 10k was done at a 7:05/mile NGP and a 146 bpm average. He even hit 5:57/mile on the downhill of Palani Rd. Looking at Gyde’s run cadence, he averaged 90 rpm over the marathon. Efficiency is a key component to running fast while keeping your heart rate low. A high turnover rate of 90 indicates that Gyde’s run form is solid. The fact that he kept his stride rate at 90 over three hours shows that his form did not break down. Looking at his run overall, it is the consistency that is most impressive. His heart rate only jumps one beat, from 144 bpm to 145 bpm from the first 13 mile to the last 13. There are no major spikes in his heart rate and he never slows for a long period of time. This again shows Gyde’s aerobic capabilities, but also highlights his smart pacing and that he executed a good nutrition plan. Another consistency is his cadence. His overall average is 90 rpm, and even up Palani Rd. it only dipped to 88.